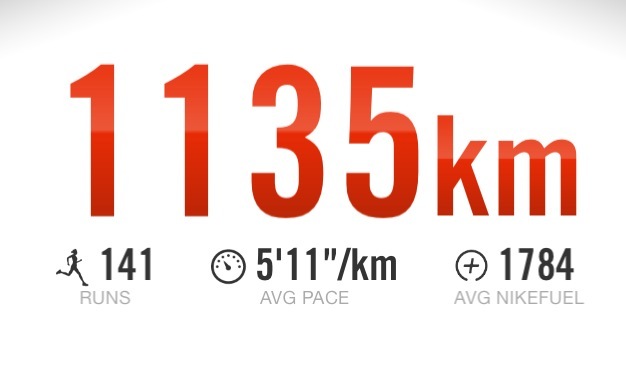 I began running consistently on the 9th June 2013. I started because I’d agreed to participate in The City 2 Surf with a couple of mates. Two of them were regular runners. Their stats on the Nike Running app proved this. I was approaching the looming 14km run – and the dreaded killer hill – with an extensive history of cardio reserved exclusively for the gym. Six days a week I spent half-an-hour on the treadmill and twenty minutes on the bike, listening to music or podcasts, bored not-quite to tears, but close, as I expunged memories of a day sat at a desk, staring at a screen. I was never a fit guy. I was, actually, the fat kid in school. It never really bothered me because very few kids derided me for it – at least not to my face. Sure, there were stifled remarks when it came to participating in weekly sport and things like that, but they weren’t cutting. No, the punches that packed the most wallop came from within – that voice in the back of my mind that lambasted me for not being able to do what everybody else seemed to find so easy. I’m very critical about myself. I always have been. Scathing, in fact. My own recriminations hurt far more than anything somebody else could articulate. But for a long time, in my younger years, I was stuck in a vicious, depressive cycle of wanting to change who I was, but not having the confidence to do it. One day, that changed. I was inspired by several friends who had begun to take their personal fitness and development seriously. And I was buoyed by a growing love for football (soccer). So, at 17 years of age, I began running down to the park every afternoon after school and would kick a ball around for an hour. On my own, using rugby posts as goals, I would dribble past an imagined opposition, score, send the ball downfield, chase it, and begin again. Especially as, over time, my stamina grew. I began running for longer – began running faster – and by the time I graduated I was looking leaner. And with that came occasional plaudits from my peers. More time passed. I joined a gym. These were my university days, where I would sometimes skip classes just to ensure I spent a few hours doing cardio. Now, family would say I was too thin. “You don’t eat,” they’d say. “You spend too much time at the gym.” But exercise was my drug. When I was involved in physical activity, that devious, self-deprecating voice in my mind dissipated. I would often postpone going out with friends and family in order to squeeze in another session. I wasn’t interested in toning my figure. Whatever that means. I wasn’t really interested in anything besides culling that Goddamned voice. I exercised to silence it. It was like that for a long time. I went to the gym because I had to. I hated it. I was bored. There is nothing worse, more monotonous, than running on a treadmill and staring at the same wall, day in, day out. But I needed to drown out the voice, so I continued. Cut to earlier this year. Still going to the gym six days a week. Maintaining a routine I genuinely despised. Then I agreed to do the City 2 Surf, and I forced myself to change my routine, to actually begin running on the street and partake in proper training. And you know what? Like football at the park, all those years ago, I loved it. Free from the routine – able to navigate a variety of routes around my neighbourhood and beyond – I ticked off the City 2 Surf and promptly signed up for a couple of half-marathons. I am challenging myself to take on a full marathon next year. I’m not sure if it’s a realistic target – I am pretty wiped after 25km, let alone 40km – but it’s something to strive for. And, see, that’s the difference. Now I run to challenge myself – to reach targets, and hopefully break personal bests – and because I enjoy it. The voice is still there. Of course it is. Occasionally it pierces the hard shell I’ve cocooned myself in. But it’s no longer the reason I spend hours of my week pounding the pavement. I do it because I derive genuine pleasure out of every run – even the bad ones.